I don’t use the word “best” very often, but this cake? 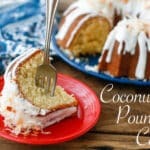 It is truly the BEST Coconut Pound Cake I have ever tasted! Oh my heavens. This cake. It is EVERYTHING I want in a coconut cake. Dense enough to not fall apart when you slice it, tender and fluffy enough for the perfect crumb, sweet but not overly sweet, with just the right amount of coconut flavor in every bite. 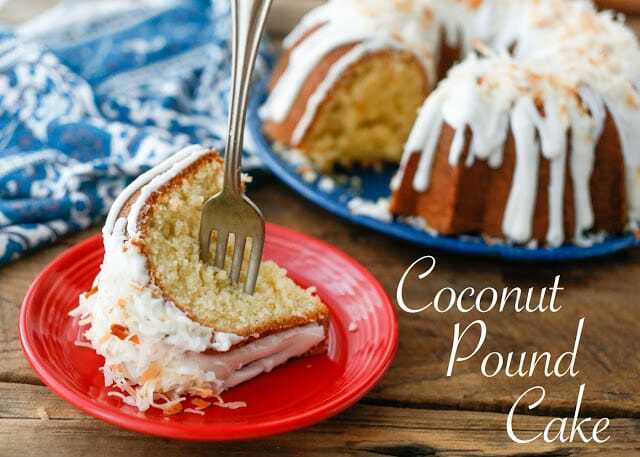 I could quite possibly talk your ears off about how much I LOVE this Coconut Pound Cake. 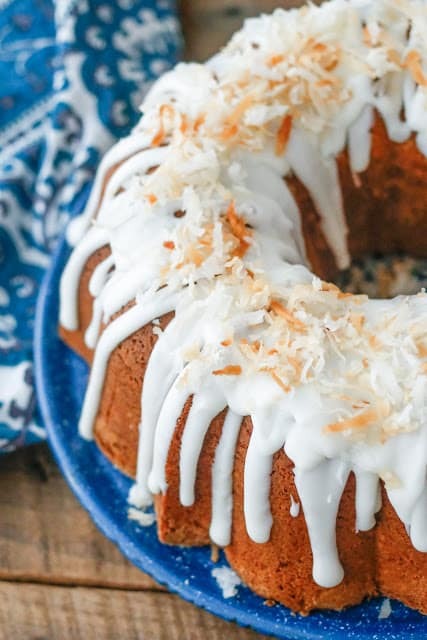 The crumb is spectacular, the crust has the perfect crunch, this beauty of a cake is drizzled with a sweet coconut icing, and topped with an extra sprinkling of coconut. This cake has pretty much destroyed my self-control. I sliced it after dinner a few nights ago and then I could not stop slicing slivers to taste for the rest of the night. This is going to be in my dessert line-up for both Thanksgiving and Christmas this year. I am beside myself thrilled with this cake. Kitchen Tip: I use this (perfect every time!) bundt pan and this mixer to make this recipe. Preheat the oven to 325°F. Arrange an oven rack in the center of the oven. Thoroughly grease and lightly flour an 8 or 10-cup bundt pan. Beat the butter and sugars together, on medium speed, until fluffy crumbs form. Add the eggs, vanilla, and coconut extract, beat again until smooth. Add the milk, beat on low speed to combine. Add the flour, baking powder, and salt. Beat again, just until combined. Stir in the coconut. Pour the batter into the prepared pan. Bake for 60-65 minutes, until golden on top and light brown on the edges. Cool in the pan on a wire rack for 15 minutes. After 15 minutes, place the cooling rack on top of the cake, hold the sides firmly and invert the pan over the rack. The cake should drop smoothly out of the pan. Tap firmly on the pan with a wooden spoon, if necessary to free the cake from the pan. Let the cake cool completely before glazing. To make the glaze, melt the butter in a small glass bowl. Add the powdered sugar, milk, and coconut extract. Whisk together until smooth. The glaze should pour off the spoon in a white stream. Add a teaspoon more milk to thin it, or 1-2 tablespoons more powdered sugar to thicken it, if necessary. Drizzle the glaze over the cake. Sprinkle generously with coconut. Store at room temperature, loosely covered, preferably not airtight. This cake will keep nicely and stay very moist for 3-4 days. Enjoy! 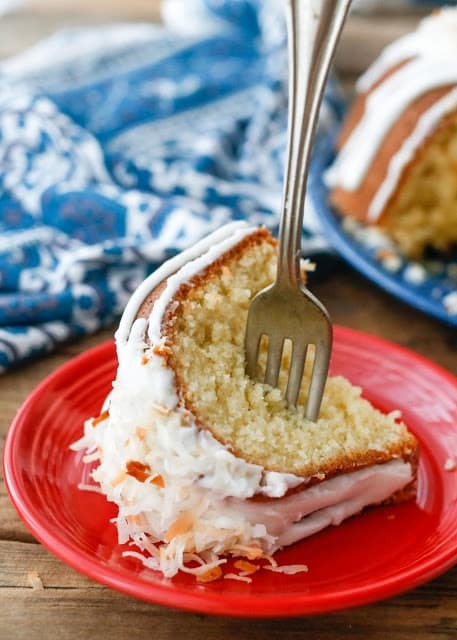 COOK’S NOTE: I’m not an advocate for buying a slew of specialty ingredients, but the coconut extract is key to the lovely flavor in this cake. While I would typically not use an imitation "vanilla" extract, I used an imitation coconut extract (because it was the only option at the store) for this recipe and it worked beautifully. How measures in gram? Every time i saw measures in cup is confused me . Help to fix it m.thank you. Could you use coconut milk in this recipe instead of regular milk & the imitation extract? I have no idea how that would work. The coconut extract provides a great deal of coconut flavor. I made this cake and read some of the comments whole it was in the oven and got so nervous but...it was perfect and a bug hit at my Aunts b day party!! So easy to make and delicious! Oh...I also couldn't find coconut extract so instead I used almond and vanilla burbon extract from Trader Joes and it was great! Can this be made a day ahead ? Can this cake be made in a loaf pan?Also can you freeze this cake? It works fine in a loaf pan, you'll want to watch it as it bakes and adjust the time accordingly for a different pan size. This does freeze nicely. I typically thaw either in the refrigerator or on the counter at room temperature. No exaggeration here. Everything you said about it is true. It is absolutely the best. I baked it exactly as directed and let it bake for 65 minutes. Perfection. I almost hesitated about making the frosting because my husband loves plain coconut pound cake, but I wanted to try it true to the recipe. It was worth it. This is our Easter Weekend Cake, but we might be naming it for every holiday from now on. I followed recipe to the letter, cooked for 65min. Looked perfect. I gotta say it didn't have much flavor and didn't taste coconut at all. I was so disappointed. That being said it didn't last long at all I don't live at high elevations or anything, I didn't substitute any of the ingredients. I wish I knew what went wrong. I'm going to give it another try though. Fingers crossed. That is absolutely bizarre. Did you use the coconut extract? Any chance the extract was old? I honestly don't know if that would affect it, but this cake typically gets rave reviews and it is loaded with coconut flavor. Is there any gluten free option for this cake? Can I use shredded coconut since I don’t have coconut extract? There is already shredded coconut in this recipe. The cake will still be tasty, but not nearly as coconut flavored without the extract. Do I use sweetened or unsweetened coconut? You'll need sweetened coconut for this recipe. Happy baking! I made this tonight and it did not come out right. First it did not release well and what did, was undercooked and heavy. If Probably needed about 15 or more minutes on the bottom but looked golden on top and light brown on the edges. I followed everything to a T and my oven temps are correct.Was so looking forward to this. :( I wonder what happened. I made this last night and it’s delicious. The only issue I had is mine developed a crunchy crust on top. I didn’t make the glaze because the cake by itself is good as is. I followed this recipe carefully,; but, after I took it out of the oven, let it rest for 15 minutes, the cake had sunk & crusty. Even though I had really buttered the pan & floured it. It's possible that it hadn't cooked through completely, as all ovens are a little different. Did you test with a toothpick for just crumbs at the center before removing it from the oven?